A printout of this page will contain contact details for Kangaroobie as well as the information shown here. Kangaroobie’s five-day program is the most popular with school groups, however the three-day program is still action-packed. Kangaroobie’s staff are trained to cater for children in grade three, right through to university students. Kangaroobie regularly welcomes school groups from around Australia and overseas – including America, Russia, Japan, Singapore, Korea and Malaysia. 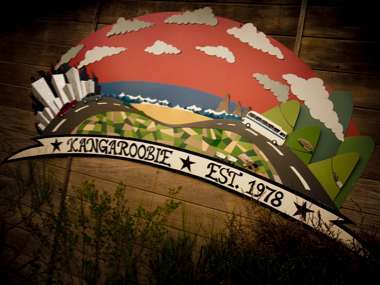 Travel to Kangaroobie from Melbourne (travel time about 3 hours). A stop for lunch and a toilet break would be made in Colac. On arrival at Kangaroobie the group will be welcomed with an introductory talk from the owners, Matt and Sophie Bowker and afternoon tea. Time will be allowed for settling in and exploring around the camp before going on an orientation walk. Night activities – after dinner we head off for a night walk. Depart Kangaroobie with a packed lunch and travel along the Great Ocean Road – visiting the beautiful coastal scenery of the Port Campbell National Park, including the Twelve Apostles & Loch Ard Gorge, before heading back to school.